Camden Reads: Book Review: 'Sitting still like a frog: mindfulness exercises for kids (and their parents)' By Eline Snel. 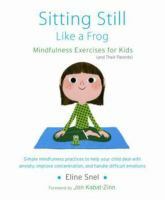 Book Review: 'Sitting still like a frog: mindfulness exercises for kids (and their parents)' By Eline Snel. Mindfulness is about being present; it focuses on breathing, relaxing, paying attention. In this sense, mindfulness is becoming a powerful tool to support mental health. This book discusses a variety of ways that mindfulness benefits kids and their parents, as well as providing short and easy activities to help parents guide and assist children. Author, Eline Snel, is a therapist that has spent the last 20 years working on mindfulness programs for kids. Snel also draws upon personal experiences raising her own children, and how mindfulness worked for her situation. In this way, the book is very open and sharing, providing personal experiences that support the exercises. The book explains what mindfulness is in an easy to understand tone. The strategies provided will help kids to learn to be more calm and focused, fall asleep, manage anger and other difficult feelings, and become more aware of what’s going on around them. There is a CD in the book that will help to complete the exercises.